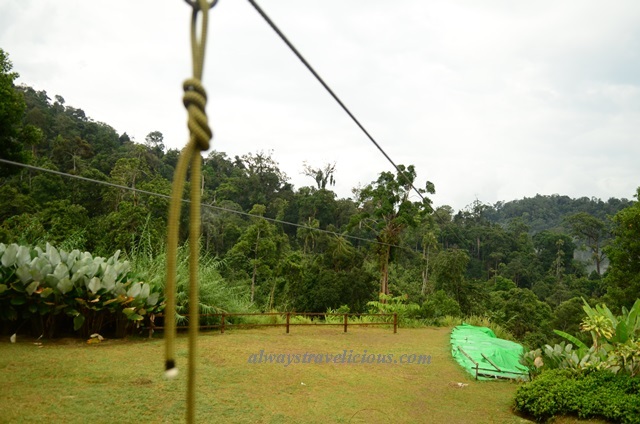 Flying Fox @ Bukit Tinggi, Malaysia - Always Travelicious ! 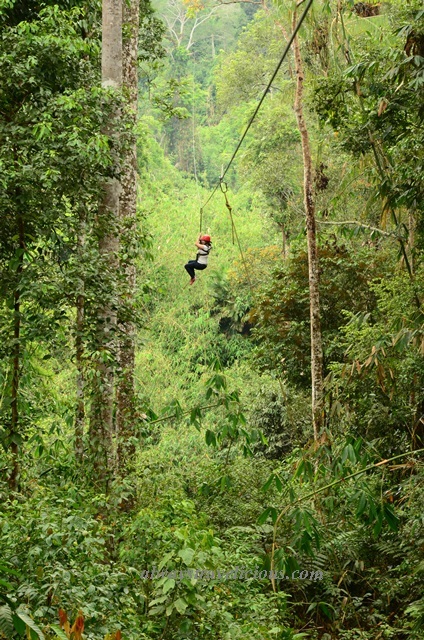 The Flying Fox at Bukit Tinggi is the longest trail in South East Asia, located in Colmar Tropicale’s Adventure Park. I saw the advertisements for it as we were driving and just mentioned to Gary as-a-matter-of-factly “hey, there’s flying fox here !” Not knowing that my comment had ignited Gary’s childhood passion as a scout and he decided that we should have a go at it. So we got all geared up (RM 80 per person), climbed up this rock-climbing-tower via the stairs and it was by the time we reached the top of the tower, saw the dangling bridge that I realized what kind of trouble me and my big mouth had gotten myself into. The bridge didn’t look too high-up when looking from below, but it is high, extremely high with me being scared of heights and the spaces between the wooden bars so wide. I wasn’t even sure if I could walk past this bridge, let alone do the flying fox from an even higher point. At this point, I really wanted to be a sitting fox. No turning back now. The instructors strolled across the bridge in 10 seconds – I was pretty sure they could do it with their eyes closed. When it was our turn, everyone walked like a granny. Finally, everyone made it to the end of the bridge. We walked through a much shorter bridge, climbed up a tree where the starting of the flying fox trail is. The instructor did whatever he had to to hook me onto the metal rope and I was not stoked with my legs in mid-air and with my own life not at my disposal. All I could do was close my eyes and scream all the way. The wind, the speed, the feeling of nothing to hold onto and the whizzing sound of my lock abrading the metal rope all made it worse. The process was fast – I’ve already reached the other end before I finished screaming. Probably less than 30 seconds. Gary went before me and he was already waiting there when I reached, having a chit chat with the instructor at the other end. 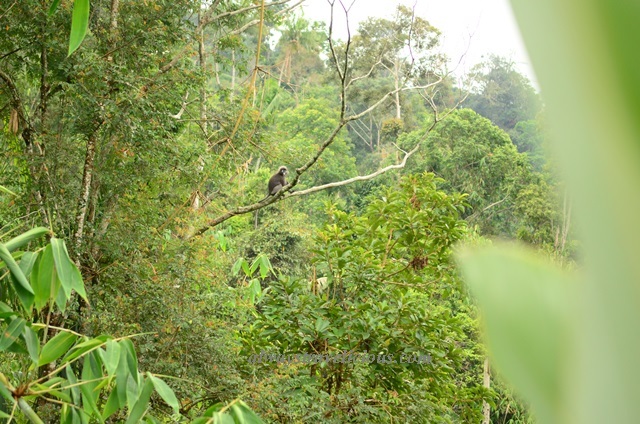 They even discovered hornbills while waiting for me. “Is that your wife?” The instructor asked. When I thought it was all over, I realized there was Part II, with yet another dangling bridge and yet another taller tree to climb. The bridge ends at the tree with the steps and we pretty much had to climb up vertically. With pale face and lips, I was not happy, finally reaching the top of the tree, sitting at the edge of the wooden plank, staring down the valley, getting ready for yet another adrenaline rush. This time, there were two metal ropes, so two people could go together. By now, I knew what to expect and I was much better at handling my fear. The gradient was not as steep as the first time so it was not as fast as well. Going together with Gary this time was much more enjoyable. I didn’t scream; I opened my eyes; and it was kinda like taking the cable car except it was much faster. This is the finishing point for the second part of flying fox. Still pale, I finally accomplished the flying fox ! The “flying” parts were done in 1 minute or less. It was getting to the point of “flying” that took time, crossing the bridge in mid air, and waiting for others to come before we proceeded to the next step. In total, the journey took about 2 hours to complete. Other than being terrified at Part I, it was definitely a thrilling experience ! Address : Km 48 Persimpangan Bertingkat Lebuhraya, Bukit Tinggi, 28750, Malaysia. **Note : Please call them (or get the hotel to call) if you would like to do the flying fox. They will arrange by groups. Wow! That looks amazing, thanks for sharing your photos. Hi. I’m Mr. David Linang from Kuching Sarawak. I’m quite interested in this games. Can you please give me their telephone number or an email add? So that I can contact them through phone or email. Please call me with this number 0104088869 or email me ([email protected]). ASAP. Thanks. You did it! I’m not sure I would but despite your protestations – you did awfully well. I’m a little nervous that they had several people on the wire at one time. Is that supposed to be alright?! I’d be worried about the combined weight! I really wanted to turn back – but then I thought – just close my eyes and do it. By the time we finished the first flying fox trail, there was a second part and there was no turning back then. It was mostly one person on the wire at one time actually.. I read somewhere the setting up cost for this was 2 milliion – so there’s gotta be some safety standard right? Pingback: Colmar Tropicale @ Bukit Tinggi, Malaysia | Always Travelicious ! 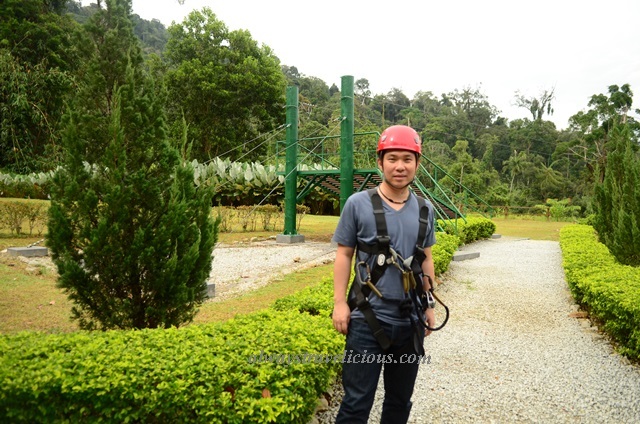 May I know how much the cost (per ride)of the flying fox which allocated at bukit tinggi ? What are the requirements to be work there in adventure activity/flyingfox.